Over the last month, AA has achieved the greatest uplift in Ad Awareness score among all the brands YouGov tracks. This is as a result of a £10m campaign, which features a young girl sat in the backseat of a car miming along to Tina Turner’s ‘Proud Mary’. The girl continues to sing despite an unexpected breakdown, thanks to the AA’s rapid response. It marks a new direction in the brand’s advertising, moving on from the traditional ‘man under a bonnet’ ad that has often characterised the campaigns of car breakdown services. YouGov brand tracking data points to the success the advert has had. 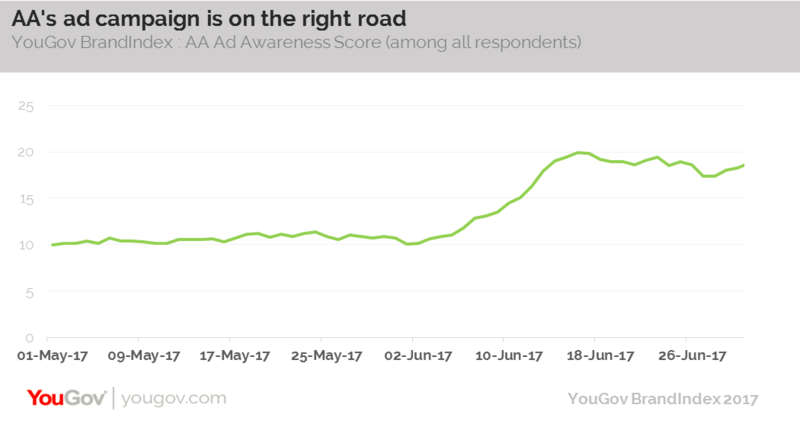 Since its release in early June, AA’s Ad Awareness score (whether someone has seen an advert for the brand in the last two weeks) among all respondents has grown by 10 points, from +10 to +20. Crucially, the score is more pronounced among those that would consider purchasing an AA product. Looking at this group, its score jumped from +16 to +35 – underlining how well targeted the ad is. Of course, the brand’s modernising efforts, and increased sense of fun in its advertising is in part to attract younger customers. Again, the signs are good for the AA – its Ad Awareness score among those aged 18-29 has grown from +10 to +22. However, our data shows that simply enjoying the advert won’t be enough to turn viewers into customers. YouGov’s Motor Insurance: Young Drivers report explores the purchasing journey of younger drivers. It shows that 70% of those aged 18-24 year-olds check product reviews before buying something, while 82% will use price comparison websites (compared to 70% of the general population). Three in ten (29%) will ask advice from family and friends prior to switching, against just a fifth (21%) of the public at large. And of course, price is still the main diving factor – 83% are usually looking for the lowest price when they are shopping. The study underlines that although AA’s successful campaign is one step on the way to attracting younger drivers, it still needs to ensure other areas of the business are suited to those potential customers’ needs. This article orginally appeared in City A.M.